Want to enjoy a romantic holiday in Bergen? 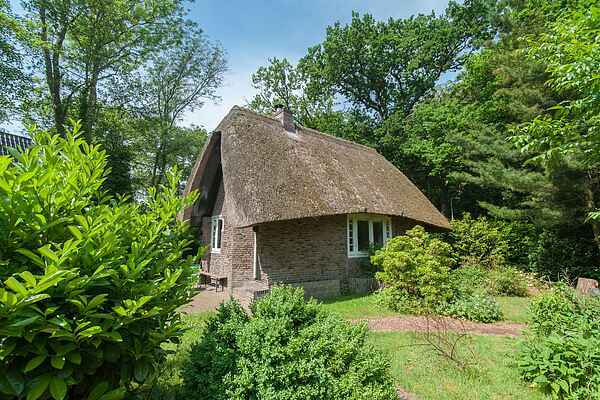 This is now possible in the smallest thatched house in the park of Meerwijk. In combination with 2 other residences on the same property, it's suitable for 6 persons. The holiday home was built in 1918 and reminds people of the then up-and-coming Bergen as a summer holiday destination, especially for artists. You will immediately fall in love with this idyllic location. Around the holiday home, you'll find a delightful fenced garden of 500 m2. You'll enjoy complete privacy here. (There's a brook in the garden) The children will have a great time on the trampoline while you relax in the garden, in front of the outdoor fireplace. There are also 2 very luxurious guesthouses, each with a private bathroom (one bathroom without a toilet). It's an ideal holiday home where you and 5 other people can enjoy your holiday at an idyllic place while having the privacy of a private bedroom and bathroom.